Venezuelan president Nicolas Maduro added that a U.S. Embassy advisor drafted the script that the coup plotters read in video they planned to air. 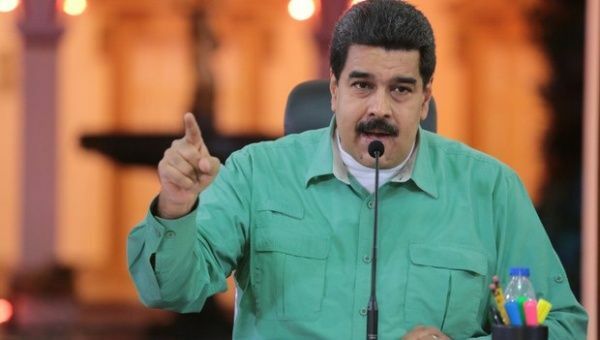 In a televised address Saturday night, Venezuela’s president Nicolas Maduro revealed new information on the foiled coup attempt against his government, including accusations that the country’s opposition leaders were aware of the plans. “Almost all of the MUD leaders knew about this plan, this ambush, almost all of them, including the four-time losing candidate,” said the Venezuelan leader, referring to opposition presidential candidate, Henrique Capriles Radonski. “I’m not saying all of them were actively involved. But it was a rumor circulating amongst them, that something was about to happen,” Maduro explained. Maduro also said that those detained have confessed to the plot and have provided new information which authorities are investigating. In addition to attempting to bribe officials and politicians with cash and visas to enter the United States, the Venezuelan president expanded on the role played by the U.S. Embassy in the country, saying that the script read by coup plotters in a video they planned to air once the plan had been initiated was crafted by an advisor at the Embassy. Maduro called on U.S. president Barack Obama to stop his officials from meddling in Venezuelan affairs. “In your name, they are organizing coup plots against democratically-elected government, such as Venezuela,” Maduro said. According to Venezuelan intelligence and testimonies, the coup was set have taken place on Feb. 12, one day after opposition leaders Leopoldo Lopez, Maria Corina Machada and Antonio Ledezma published a “Transition” program which outlined measures including the privatization of oil, deregulation of the economy and agreements with International Monetary Fund.. The plan included targetted assassinations and bombing a series of targets – including teleSUR’s headquarters in Caracas – while opposition activists staged violent protests in the streets to mark one year since the start of opposition-led protests that claimed 43 lives. Evidence presented on Venezuelan TV showed a video of the coup plotters, as well as the 10-year U.S. visa granted to one of the accused. February 14, 2015 “ICH” – “Telesur” – The president of Venezuela’s national assembly, Diosdado Cabello, presented further evidence of the right-wing plot to overthrow the Bolivarian government Friday evening. Cabello presented evidence of the foiled plans, including a video showing members of the military prior to recording a message announcing that the military no longer recognized the government. The video, which was set to be aired after planned attacks had been carried out, was to have been televised by a station in Venezuela or Miami. Cabello also showed a 10-year U.S. visa given to one of the detained, days before the plan was to be implemented. Cabello also said that a member of the Royal Canadian Mounted Police, and a member of the U.K. diplomatic core in Venezuela, had been involved in plans, including seeking information on airport capacity in case of emergencies. According to Venezuelan intelligence, the computers seized to military detractors revealed maps from the places where the opposition was plotting to carry out attacks, including the Miraflores presidential palace, and the headquarters of teleSUR in Caracas. Venezuelan president Nicolas Maduro announced Thursday that the government had thwarted a coup attempt which was being coordinated by Venezuela’s right-wing opposition with the support of the U.S. government. The plans were to take place exactly one year after opposition-led acts of violence rocked the country, claiming 43 lives and billions in damage. On Wednesday, opposition leaders Leopoldo Lopez, Maria Corina Machado and Antonio Ledezma released a “transition plan” which involved privatization of the country’s oil, deregulation of the economy and accords with “international financial institutions” including the International Monetary Fund. La nueva Televisión del Sur C.A.